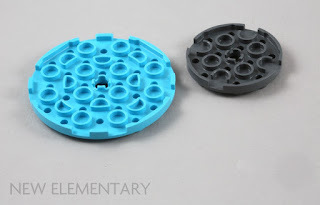 However, some new elements are coming in 2019 that will connect to turntables: the new 'splat' gears as shown below – Gear Wheel 4X4, Z10 (Design ID 35443) and Gear Wheel 2X2, Z6 (Design ID 35442), and Gear Wheel 6X6, Z14 (Design ID 35446) seen in forthcoming The LEGO Movie 2 set 70828 Pop-Up Party Bus. 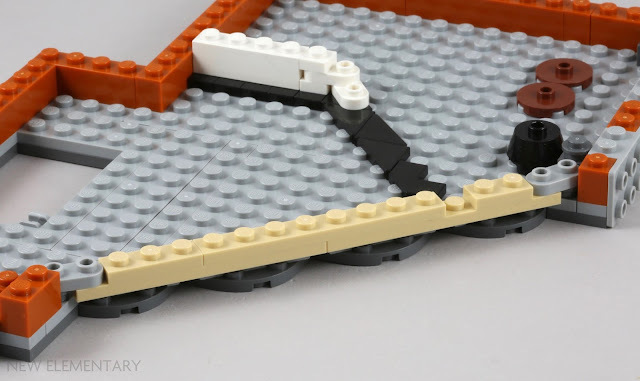 Since the new turntable is placed on the baseplate and then covered by other parts without utilising any of its functional 'turntable' abilities, I don't think this is a particularly inspired example of how to use the part! Next up we have Tile 2x2 with 1x2 Vertical Plate in Dark Stone Grey [TLG]/ Dark Bluish Gray [BL] (Element ID 6250018 | Design ID 41682). I mentioned that it appears in Bag 1 in the previous post and it forms part of the tow truck's moving tow arm. The 2x2 tile attaches onto the truck bed while the 1x2 plate allows the arm to attach in the perpendiular position. 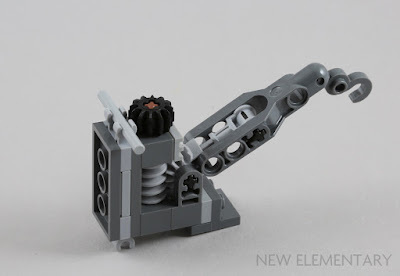 This is a very effective way to connect the functional portion of the build to the truck bed and results in a very stable mechanism, made to withstand younger hands excitedly turning the gear to move the arm up and down no doubt. I mentioned the use of Black Minifigure Skate (Element ID 6253287 | Design ID 18754) as a squeegee to clean windscreens but there are actually two in the set (and a spare was supplied to give three overall). The other one appears on top of the wheeled tool trolley that sits within the repair garage on the ground floor. I'm a sucker for these little builds and I loved the use of Silver Metallic [TLG]/Flat Silver [BL] Mini Roller Skate (Element ID 6215447 | Design ID 18747). Yes the scale fits a minifigure but not the tools but hey, this is LEGO. Can someone tell me what the tool on the top made of the skate and headlight brick is meant to be? This is the first wand I have seen in a set outside of the Wizarding World theme, and Black Wand (Element ID 6232209 | Design ID 36752) it is very effectively used as part of the wheel mounter within the repair garage. As a slight aside, I was intruigued to note that while the wand is still supplied as two wands on a sprue, the actual sprue design was very different to the one I explored recently in Harry Potter and the Spurious Sprue. Left is the Wizarding World sprue, right came in 10264 Creator Garage, but both have the same Design ID – 36752. 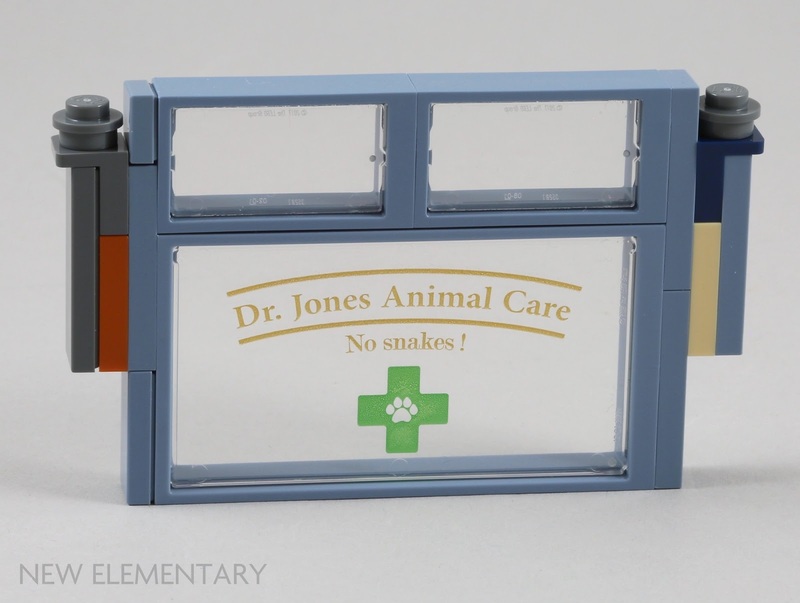 While the new window elements are definitely still used as windows within the build, Sand Blue Windscreen Frame 2X6X2 (Element ID 6253475 | Design ID 13760) is used to create the Animal Care level's bay window in rather a clever fashion. 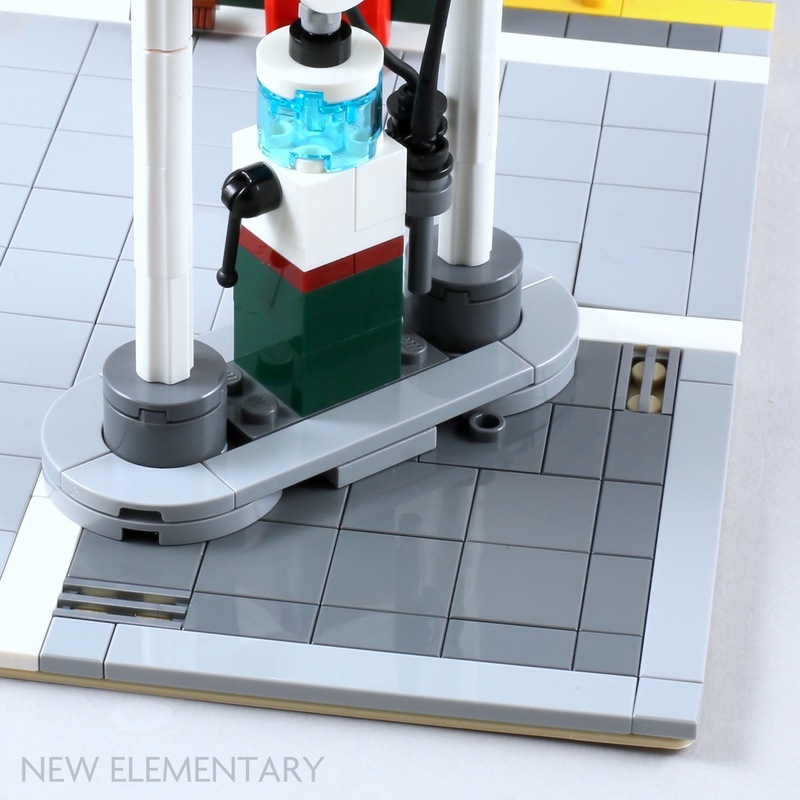 The use of the stacked telescopes to secure the frame into a vertical position works very well, especially with the tidy tiling at the window base. The other window on this floor –'Dr. Jones' – uses the Plate 1X1, w/ 1.5 Plate 1X1, Downwards newly coloured in Earth Blue [TLG]/Dark Blue [BL] (Element ID 6254479 | Design ID 36841) to form a window sub-build that simply slips into place. 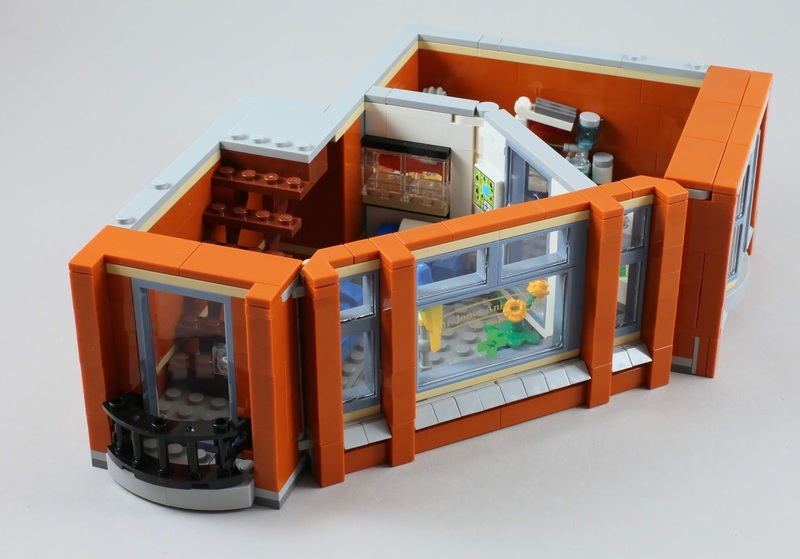 The Dark Orange elements that are new (plus those that have returned after a prolonged time) are all used within the wall structure of the animal care centre and the apartment above. 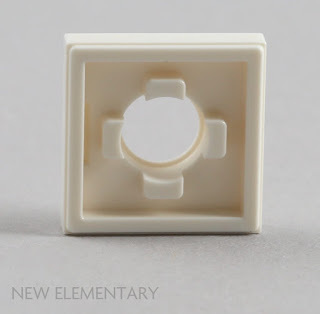 The actual corners are angled using a 2018 element, Plate 1X2, Rounded, No. 1 (Design ID 35480), whose rounded corners allow the plate to be angled without getting in the way of neighbouring studs. You can see this method used for both the facade and also the internal wall partition between the waiting area and the animal care clinic. By the time the windows and walls are in position, all that is required are the new Dark Orange Tile 2X2, Deg. 90, w/ deg. 45 cut (Element ID 6253425 | Design ID 27263) to complete the tiled finish around those angles, ready for the next floor to be placed on top. 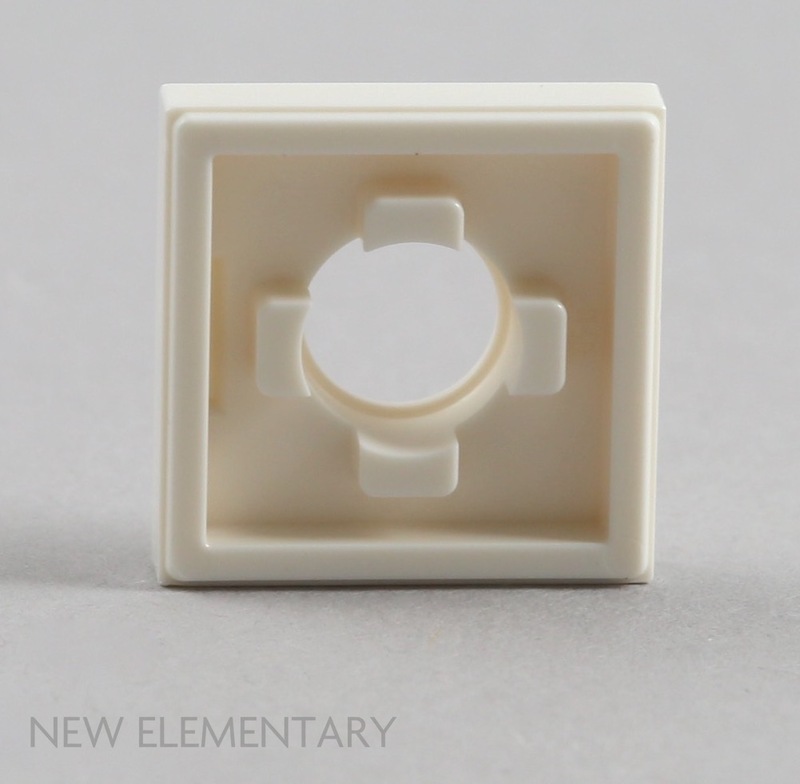 The only new element left to discuss is White Brick 1X2, Outside Half Bow (Element ID 6248827 | Design ID 37352) which first appeared in Medium Stone Grey in 10262 James Bond Aston Martin. You may have already noticed these are used as part of the seating in the clinic's waiting area. I had the sense that these were not actually very comfortable for minifigures as their legs hung off the ends. 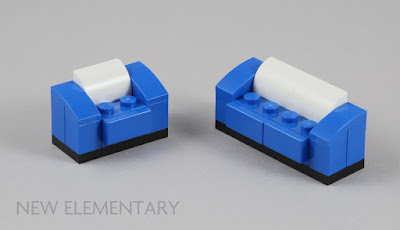 I appreciate that in reality we actually bend our legs when sitting, but normally a minifigure sits with a portion of the seat extending out to the legs. My minifigures did not look very happy on these couches, they felt undue sacral pressure. 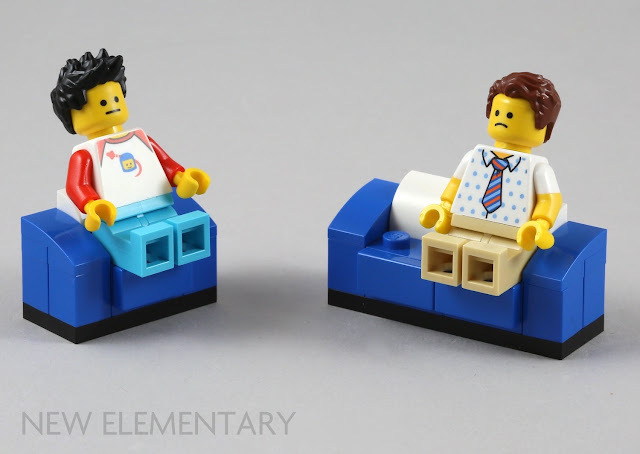 I had a fairly quick look back at previous seating arrangements within the modular building series, and it seems the majority of seats have most, if not all, of the minifigure's leg is actually on the seat itself. Another recent element I was pleased to see appearing in the set was Candle No.1 in White (Element ID 6234807 | Design ID 37762). Only one is supplied and used as the arm of the infrared lamp to keep Mr Frog warm in his little tank, it connects to Plate 1X2 W. Vertical Shaft (Design ID 88072) at the base. 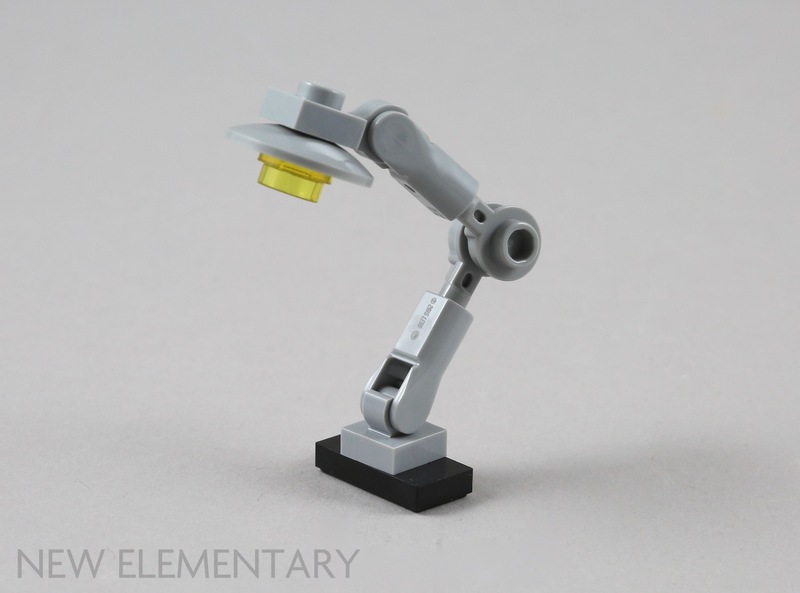 On the subject of lamps, the anglepoise lamp on Dr Jones' desk is also a nice little build to make use of Medium Stone Grey Plate 1X1 Round w/ Horizontal 3.2 Shaft (Wlement ID 6227897 | Design ID 32828). 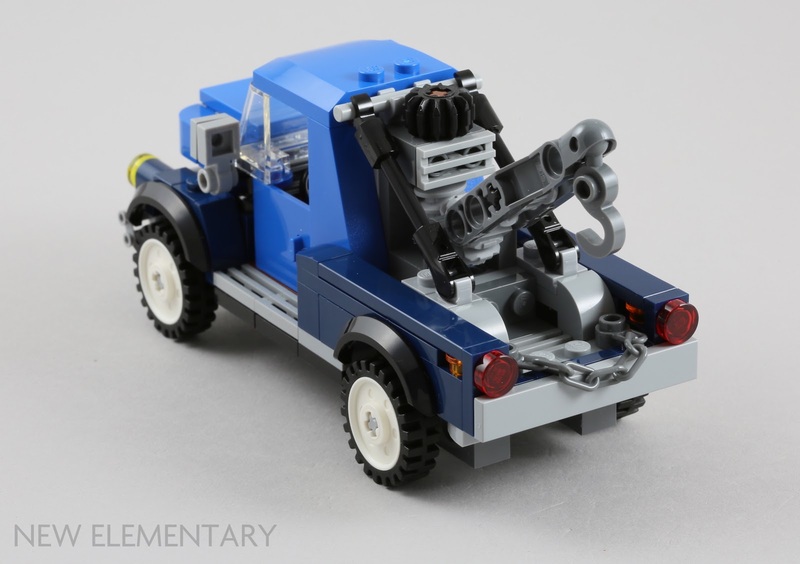 Since this element has only appeared in very small amounts within three sets thus far (including 10262 James Bond Aston Martin and 21311 Voltron), it is nice to see them in another set. I think that's us had a look at the position of all the new parts contained within 10264 Corner Garage! With regard to the turntable, there are three other compatible parts you didn't bring up: Brick 4X4 Round W. Ø4.9 W. Kl. (Design ID 87081), Key Stone 4X4 W. Ø4.85 Hole (Design ID 87750), and Circle Brick 6X6 W/4.85 Hole (Design ID 18897). Notably, on the previous Bottom W. Turntable 4X4 (Design ID 61485), 87081 behaves differently from the various compatible plates and bricks, in that it functions as a click hinge/locking hinge rather than a free-spinning turntable. But on this new 2x2 turntable base, it will presumably spin freely like any other compatible part, since the locking functionality is dependent on the outside ridges of the 4x4 turntable base. Additionally, as of next year there will be a third size of the "splat gear" which you didn't mention: extrapolating from the other part names, we can call it Gear Wheel 6X6, Z14 (Design ID unknown). So far it is only known to be appearing in set 70828 Pop-Up Party Bus from the LEGO Movie 2 theme, in which two of this piece appear in Vibrant Coral. While this set doesn't use the turntable for an actual rotating function, I think its use here is understandable, since if it had used a more traditional type of hinge like a 2x2 jumper plate or a classic 2x2 turntable, it would not have been able to lock the angled curb and columns in place using a 3M cross axle with end stop, since the end stop would collide with either the stud or the top of the plate. As a result it would be much easier for that entire assembly to pop off of its base. 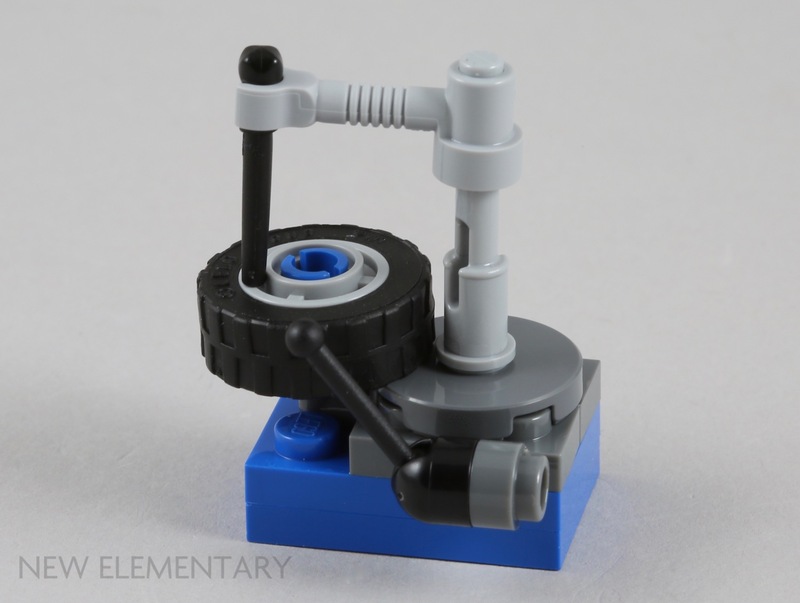 We've seen these sorts of turntables used simply to angle a fixed section of the build before, such as in Ninjago City where this is the method used to attach the bathroom and radio tower in the High Rise section. 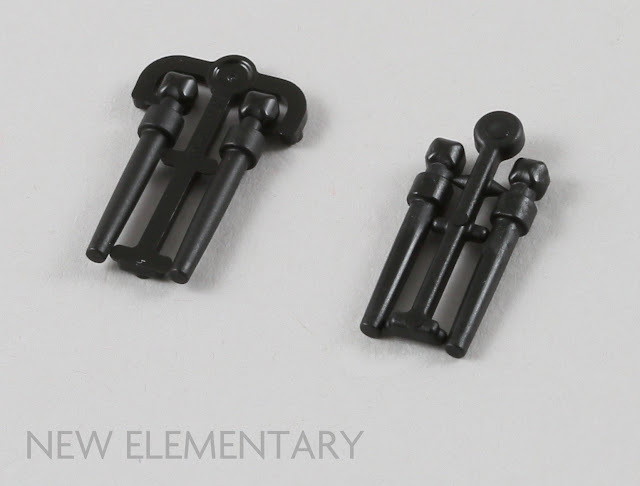 My understanding is that the wand sprue was redesigned to make the wands easier to remove (since they're now only attached to the sprue on one side rather than on both sides). I've heard of people finding both versions in the Harry Potter sets. I can assume the fish being upside-down is an intentional joke, and an unusually grim one (I wonder if it was dead before being brought to the vet's office or if it died in his care and he's not as good a vet as one might wish). The official pics on the back of the box also show it this way. 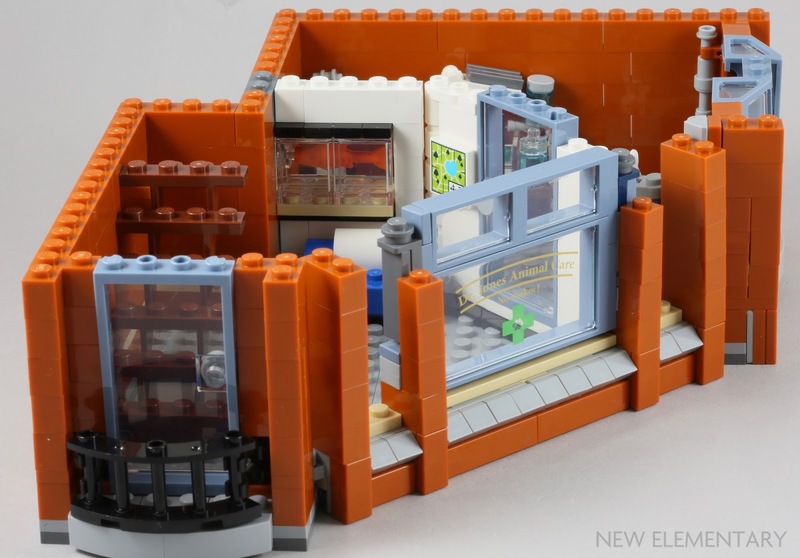 That said, I was recently surprised to see that this is not the first example of wanton cruelty to goldfish in the modular buildings. 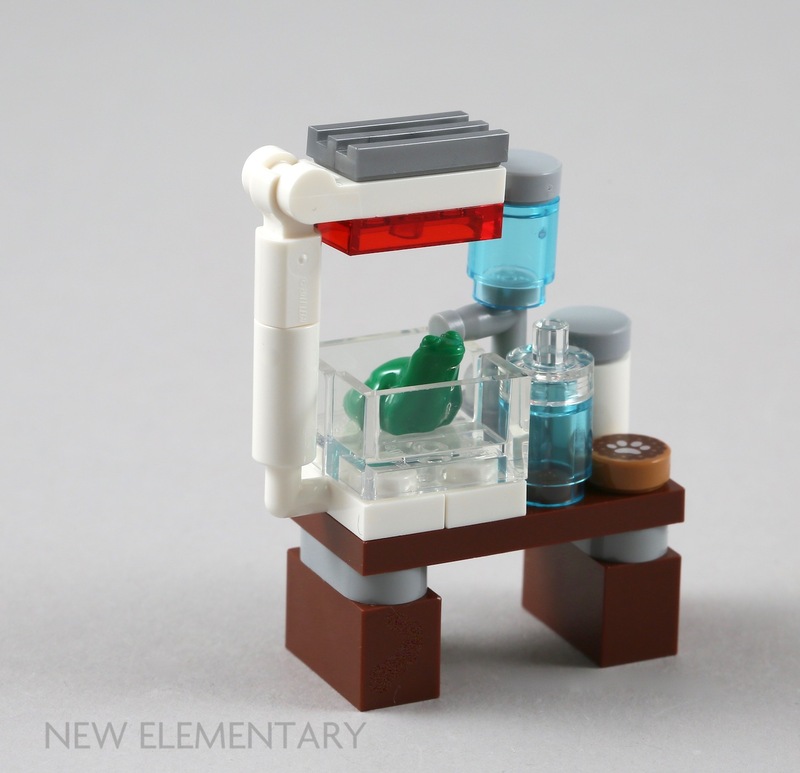 The official pics for 10218 Pet Shop include an image of pet shop owner in the kitchen of the upstairs apartment frying that set's goldfish in a skillet as the cat watches eagerly! Haha, I was literally just updating the post with the 6x6 splat gear as you commented! - now updated. Well, given the vet's doctorate is in archaeology or anthropology, rather than veterinary medicine, I suspect he might not be the best vet. I am a car mechanic and I haven't got a clue what that tool on the trolley represents. Bench vise was the best I could come up with as well. It's really the only thing I could see being attached to the top of a tool cart like that (besides another tool chest), and it's also the only thing that I can think of that would look like that. I think the fact that people are having such a hard time figuring it out (in context, no less), that it doesn't really represent all of the bench vise (there's no representation of the moving jaw, which would only require the addition of a 1x1 round plate and a 1x1 plate), and that it doesn't seem to offer any play value means we can probably chalk this aspect up as a rare fail. Curiously, Bricklink's note on the 4x4 base fails to mention the Key Stone and 6x6 round brick that Unknown mentioned, and they misidentify Elspeth's 10x10 octagonal plate as an 8x8 (I've made that mistake myself a few times, as I so rarely use them). But I can't think of any other parts that this should work with...though now that they have a 2x2 base that may change. What I'd like to know is how loose this connection is. 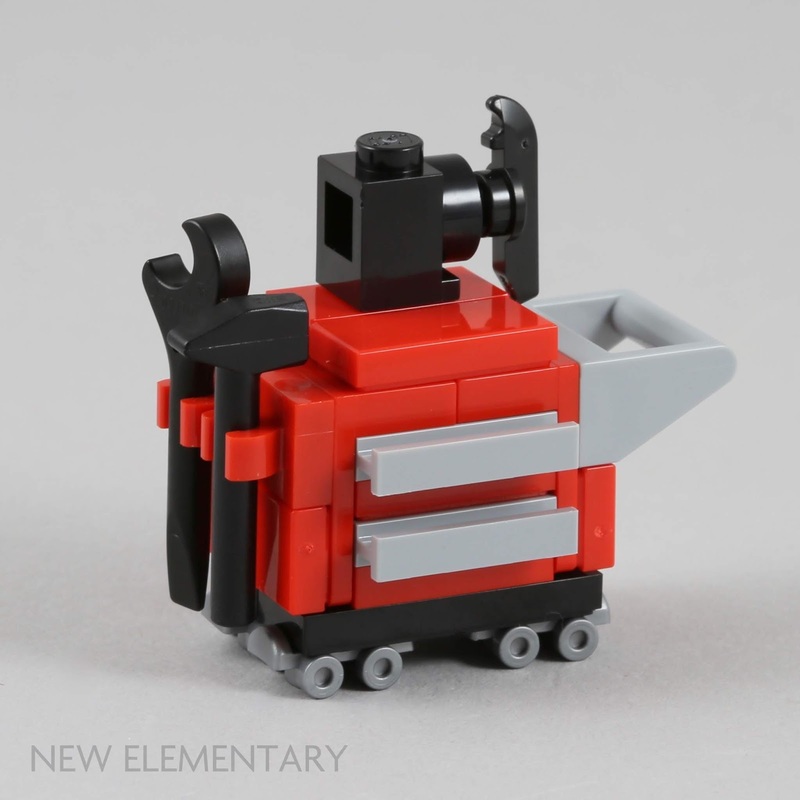 I've been hoping they'd release the 4x4 locking base in red someday, as I have a use for it, but so far that base is limited to greyscale. The standard 2x2 turntable spins very freely (and the top actually rattles around if you shake it), so that won't work for my needs. If this will actually hold a 4x4 round plate relatively still, I may be able to make it work, even if it doesn't lock it in place. It'll definitely be stable enough to stay in place in most places you might want to use it as an actual turntable, but it doesn't lock as strongly as hinges like the AT-AT, Life On Mars, or Knights' Kingdom style "click hinges" that are actually meant as joints that can support the weight of a large or medium-sized model. If you had any of the older style of 4x4 locking turntables from 2000 to 2008 (https://www.bricklink.com/catalogItemIn.asp?P=30516c01/https://www.bricklink.com/v2/catalog/catalogitem.page?P=30516c02), it's a lot like those ones. I built a much more accurate, non-stickered, 9v motorized MOC of the Shellraiser from the previous TMNT series, but right now all I have is a red dome in the center of the roof. If this works as I hope, I should be able to mount the pop-up cannon (which I haven't designed, because there hasn't been any point in doing so) instead. If I used the existing 2x2 turntable, the cannon would just swing around lazily as it hurtles around our club layouts. Well, I tend to run the Shellraiser as fast as it can handle, so "lazily" might not be the proper word. "Violently" might be more accurate. Anyways, the 2x2 turntable being out, I've been keeping an eye on the 4x4 locking version. 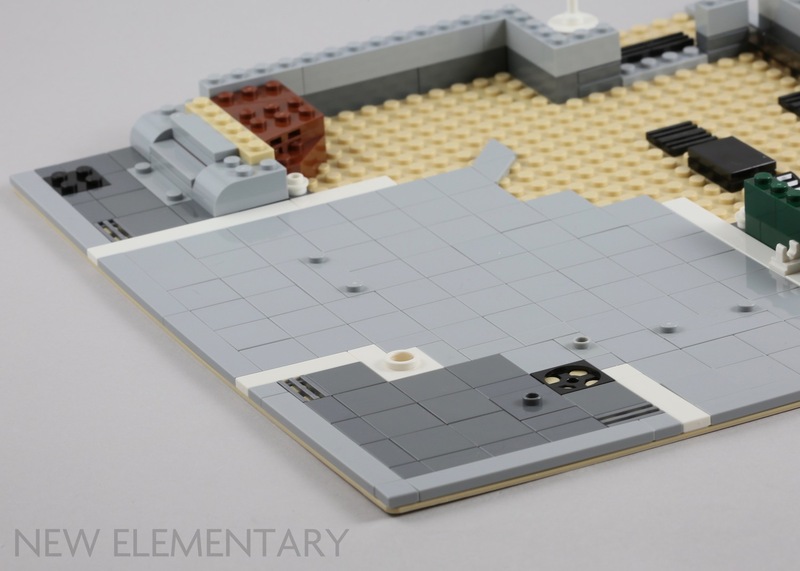 Problem is, they make the 4x4 round plate (and I think the round brick, too? 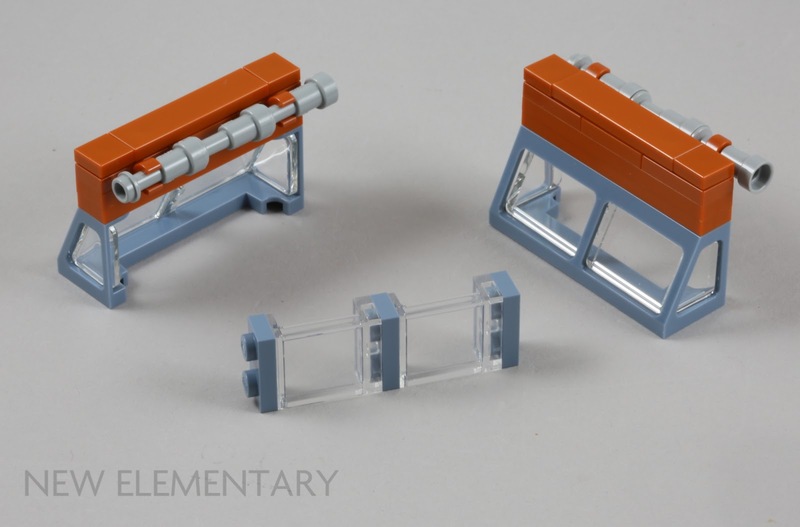 ), but to match the look I'd need the locking base in red too. I'm built on top of olive-green 4x4 car hoods, so the old 4x4 turntable with the tall base is out of the question without involving a Dremel. Thanks for the article. 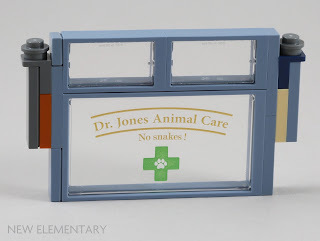 Question: what's the exact colour of the door piece used for the vet's office entrance and the bathroom on the second floor? Medium Azure or Medium Blue?